of matches on it over the years. However, as soon as I got there I feared the worst. It was flat calm like a mill pond and the only movement I could see was the very rare small F1 or roach topping. Meanwhile you could clearly see the resident big F1s lolling about in the much deeper pegs to my left. With my peg being no more than 3ft anywhere it just never felt right with today’s conditions. After four painful hours I’d got about 10lb and was going nowhere. 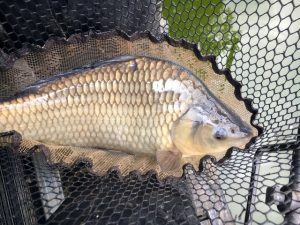 Thankfully one of my maggot swims, angled as far to my left as comfortable, where it was just 6in deeper, yielded a much needed late run of fish. I ended up with 37lb, which beat the peg opposite and everyone behind me in the shallow ‘canal arm’. However, everyone in the deeper water caught considerably more. 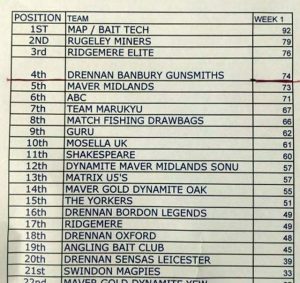 With the section also split with Top Pool I still don’t know where I came in my 26! 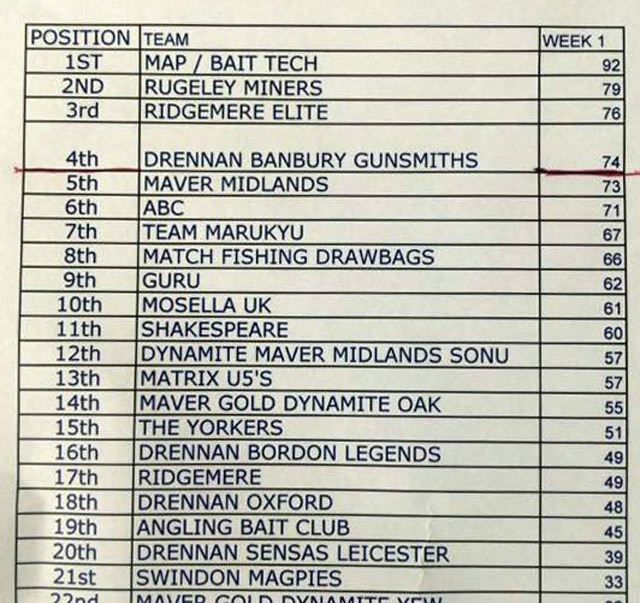 Teamwise the rest of my Match Fishing Drawbags team had thankfully done the business and we ended up 8th out of 26 with 66 points. Some way behind early leaders MAP on 92, but it’s very early days and there will be plenty of blowouts and surprises over the next nine rounds I’m sure. For our team, Paul Bick was 4th in his 26 off Canal/Extension, Joe Carass was about 8th on High and Craig Goldstraw was 4th in his zone on New/Jennys (three of the sections are split between two lakes). I had to laugh when Craig said you had to find 4ft of water. I didn’t have that anywhere! Chatting to people afterwards, almost everyone said they caught the bulk of their fish in the deeper water. I am sure the conditions lead to that on the day. Next round could be a completely different story, which is why you have to try and keep in touch. Easier said than done! I cannot blame everything on my peg as it’s normally decent and I’m sure I could have caught a bit more. Perhaps I searched around too much and should have just fed and waited a bit more rather than being impatient? I fished nice and fine, tried potting, throwing, even small amounts of groundbait and hooking on a micro pellet to no avail. Never mind. Some days everything you do works. Other days, like this one, things don’t go quite to plan.